Bring the feeling of happiness by sending this Pretty and Colorful Majestic 30 Mixed Gerbera Arrangement with Pure Passion into the life of your most special person. 30 Assorted Gerberas Arrangement with Cadburys Celebration pack. 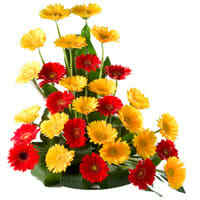 30 Assorted Gerberas Arrangement with 500 grms Assorted Sweets. 30 Assorted Gerberas Arrangement with 16 pcs Ferrero Rocher chocolate box.